Perhaps you are fascinated by logistics as well as production and resource planning? Or does network and process optimization or personnel planning say more to you? Even if you are better suited to controlling, portfolio management, or actuarial mathematics: when decisions have to be taken over investment or product selection, how personnel are utilized or concerning the business location, order processing or machine design, then optimization procedures play an important role. In four semesters, the Mathematics in Operations Research Master’s program conveys how models and methods of decision-making support look and how they function. The theory and applications of non-linear, combinatorial, and discrete optimization as well as numerical analysis and stochastics constitute the specializations in the Mathematics in Operations Research Master’s program. Students learn to express practical problems in mathematical models and solve them algorithmically. Also of importance here is the communication of the intended set of results in a comprehensible manner – a real challenge given that in practice, colleagues from different disciplines often work together in a single team. Having selected minor modules from the areas of Economics, Informatics or Information Systems, graduates achieve highly later on through their applied and interdisciplinary knowledge. Seminars on rhetoric and presentation techniques round out their profile. Here you will find important dates, deadlines and other relevant information. Wednesday, 6 February, at 16:00 in room MI 03.06.011. There, you will get on this year's projects, important dates and the application process. This is a joint meeting for both the "Case Studies Discrete Optimization" and the "Case Studies Nonlinear Optimization". More information under Case Studies in the summer semester 2019. Our graduation ceremony will take place on 12th July, starting at 16:00. More information, including a possibility to register for the event, is available here. We look forward to your participation! The "Mathematics in Operations Research" Master’s program is full time. The standard duration of study is four semesters. Students can commence the Master’s program at TUM in either the winter or summer semester. You can pursue the entire "Mathematics in Operations Research" Master’s program in English. Certain teaching sessions take place in German. For your minor, you choose modules from the areas of Economics (Management Science / Logistics), Infomation Systems (Business Analytics) or Informatics (Efficient Algorithms / Machine Learning). Be sure to take into consideration that the assignment of the final thesis is conditional in some departments upon successful completion of the Advanced Seminar. Courses in the areas of Numerical Analysis, Stochastics and Applied Analysis comprise an important component for students of this Master's program, as does Non-Linear and Discrete Optimization. Details of all modules relevant to the degree program, along with associated times and locations, are available in the department’s curriculum at TUMonline. Here you can create your own timetable and save it digitally. Whether you write on optimization, stochastics, numerical analysis or applied analysis depends on the area in which you have acquired advanced knowledge. Read everything you need to know about the Master’s thesis here. A four-week professional internship is integrated into the program. The accompanying Internship Seminar offers you the opportunity to inform yourself about suitable occupations and to discuss the experience you acquired during the internship. You can round up your individual personal competence profile through modules out of the field of extradisciplinary competencies. Lead by your own interests you can choose out of a large offer of soft skilsl or language courses. During your Master's program, you can already spend one to two semesters abroad at one of TUM's partner universities. Important: Inform yourself in good time. The recognition of modules completed abroad is possible. Many of our students already get to know their future employer during their studies. TUM maintains close contact with leading corporations. Our Career Service is there to help you. Every third Master's graduate successfully completes a Doctoral Project. Academic and Examination Regulations Master Mathematics in Operations Research. Information on the degree program's concept can be found in the degree program documentation. The prerequisite for the TUM Master´s program "Mathematics in Operations Research" is an accredited university degree in Mathematics, or a comparable course of study. If you are interested in the Master´s program you should refer to the "Basics of the Bachelor´s degree course in Mathematics at the TU Munich" (see check list) to verify the required competencies in detail. You need to have acquired at least 19 ECTS credits of the lectures listed in Table A3.1 and at least 14 of the ones listed in Table A3.2. If these conditions have been missed by only a narrow margin, you'll have points deducted during the application process and maybe you'll be obliged to complete some of these modules during your first year of the Master´s program. If the commission thinks that there is too much missing content, your application will be rejected. In case the language of instruction during your undergraduate study was neither German nor English, you will need a language certificate (see Check List) in one of these languages before the end of the application period. Students who provide an English language certificate with their application are admitted on the condition that they complete one module providing integrative knowledge of the German language within the first two semesters of their studies. TUM offers free courses for that purpose (see Check List). If you already have a German language certificate to at least the A1 level, please submit that with your application. A list of certificates recognized as proof of German or English language proficiency may be found here. Language certificates also have to be notarized, unless the Institute sends them directly to TUM (TOEFL, IELTS). German as a foreign language for international students is offered free of charge by the TUM Language Center. Language tests are only offered on the appointed days and their evaluation requires some time. You have to allow some extra time if the certificate has to be notarized. In any case the certificate has to arrive at TUM before the application deadline. Schedule enough time for that! You can apply for the preliminary documentation from uni-assist throughout the year but you have to apply before the end of TUM application period. Please be sure to hand in your preliminary documentation to TUM as soon as you receive it. To meet the deadline, it is essential that the post is received and stamped at TUM by the deadline! You don't need to have your Bachelor's degree at the moment of your application: some documents, such as your Bachelor's certificate, can be sent during and up to the so called enrollment deadline. This deadline is normally about 5 weeks after the start of the corresponding semester. Compile the necessary documents for your application as early as possible. Acquiring official certifications and language tests may take a very long time. Essential parts of the application for the Master´s program at the Technical University of Munich can be filled in on the platform TUMonline. A candidate account is required for this purpose. You can find detailled information on this website. Bachelor’s Degree or comparable qualification for admission ✓ If you proceed directly after your TUM Bachelor to the TUM Master your diploma will be forwarded to the Student Registration Office automatically. The electronic applicant wizard guides you through the application step by step. Important: choose "consecutive Master degree" as the form of study below the point, "study programme selection". At the end of the online application, you will receive a list of all the required supporting documents as well as the application for admission. Check your candidate account on TUMonline on a regular basis. You will be notified there about missing documents and receive an offer or refusal of a study place. If you do not receive an offer, you can register one more time for the selection procedure. You will also receive important individual information at the e-mail address provided in your applicant account. In order to obtain a place in the Master´s program, you must follow the procedure for verification of eligibility. This takes place once every six months and is carried out by the Faculty of Mathematics. After reviewing your application documents, the board of examiners decides whether you will receive an acceptance, a rejection, or an invitation to an aptitude assessment interview. The suitability interview, which has to be completed by only a few candidates, takes place personally in Garching or as a webconference in German or English and lasts 20 to 30 minutes. The interview focuses on the candidates' motivation and ability to apply structured working methods. The expertise acquired from undergraduate courses is also assessed. Once all application documents are complete and have been received on time, and you have been accepted and confirmed your study place in your TUMonline-Account, you still have to pay the tuition fees. After that you will be enrolled. Please find out for which modules from your Bachelor´s degree you may be able to receive credits from your Bachelor´s degree and where you have to submit the application request for their recognition. 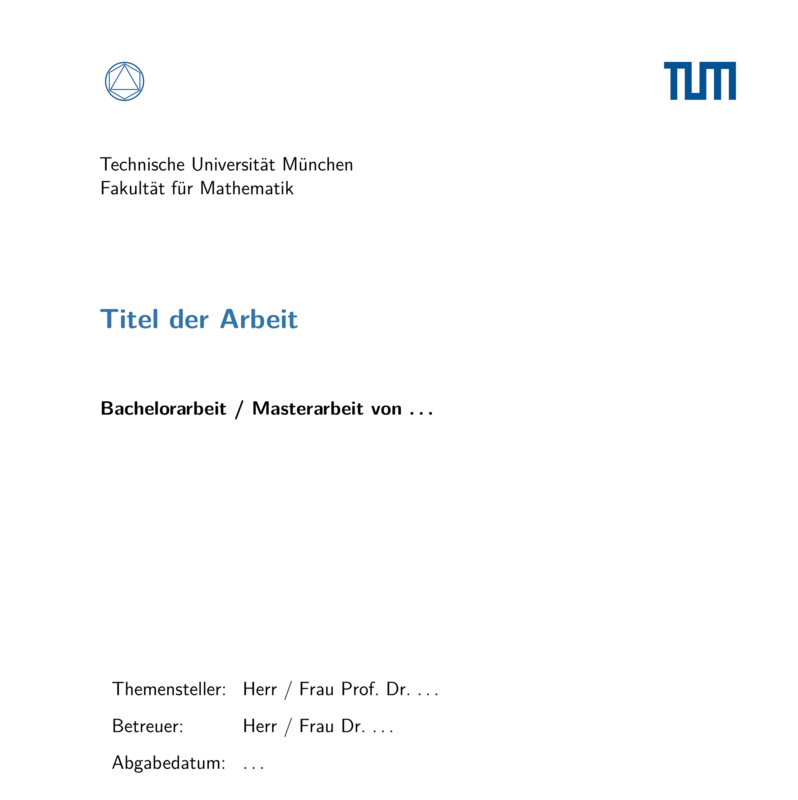 In order to successfully complete a Master’s program at the TUM Department of Mathematics, students must write a scientific thesis: the Master’s thesis. Everything you need to know about the Master’s thesis, from planning to submission, can be found here in overview. For questions relating to the content of your Master’s thesis, please contact your thesis supervisor as defined in the General Academic and Examination Regulations (APSO) or the Student Advisory Office responsible. You have six months to complete your Master’s thesis. This period begins on the date of registration. You normally complete the Master’s thesis in the fourth semester of your Master’s program, after you have fulfilled all other academic and exam requirements. It is possible to register your Master’s thesis on the 1st and 15th of each month (though not retrospectively). Please submit the registration form signed by your thesis supervisor at the Infopoint Mathematics. In addition to the Registration Form, you must also sign and submit the Route Card for the Diploma Supplement of the TUM Department of Mathematics. Please also submit the route card even if no activities are supposed to be incorporated. Please do not forget to provide a German and an English title for your thesis – both will appear on your transcript of records. Note: The Diploma Supplement is an English-language supplement to the university diploma and describes the qualifications linked to the study program. Under the heading “Additional Information” in this document, you can request the incorporation of specific details of extracurricular activities completed within the framework of your degree course. The thesis can be written in the German or English language. Here you indicate the topic of the work as well as your name and that of the supervisor. In addition, you indicate the date of submission. Please write an e-mail containing the new thesis title to master(at)ma.tum.de and copy in your co-supervisor and your supervisor. The Master’s thesis is to be submitted in bound form (adhesive binding). On the spine of your Master’s thesis, please indicate your first name and surname and the short title of the thesis. You must submit two identical, signed copies of your Master’s thesis. You submit one signed copy to the thesis supervisor (for grading) and the second copy at the Infopoint Mathematics (to be archived). If in addition to the thesis supervisor you had further co-supervisors, you should arrange for each of these to receive a copy, too. You do not receive confirmation of submission. Should the submission date fall on a weekend or a public holiday, submission on the subsequent workday is also possible. Theses can of course also be submitted prior to the planned submission date. In the event that you need more time to work on your thesis, you must submit an application at the Infopoint Mathematics for an extension, at least seven days prior to the planned submission date. This application must have been signed by your thesis supervisor. In the event of a second extension, the Chair of the Examination Board must sign the application as well as the thesis supervisor. The typesetting system LaTeX is the standard program worldwide for the compilation of theses that contain mathematical formulas. It is recommended that you familiarize yourself with LaTeX as early as possible during the course of your studies. It is a good exercise to prepare sheets for seminar presentations using LaTeX. You can find further information, templates and helpful advice on our LaTeX info page. Corporate design and use of TUM and TUM Department of Mathematics logos. The TUM Library does not only offer outstanding access to all manner of books, newspapers, and electronic media, it also offers courses on, by way of example, bibliographical research and how to correctly cite works. Please also note subject-specific practices when citing works. The English Writing Center offers all TUM members free one-to-one advice on writing English texts and helps you to enhance your writing skills. You can print your thesis at the computer room. Contact your supervisor to receive a sufficient print quota. Registration deadline is 15th March! Take part in the workshop with our cooperation partner ERGO and get to know the work of actuaries. Dr. Martin Gebhard (Bonn), TopMath graduate of the 11th cohort, on May 23rd 2019 at 6 PM will give a talk on "Automorphisms of Algebraic Surfaces". In the Summer Semester 2019, 5 renowned guests hold lectures on their research areas as part of the John von Neumann Professorship. These are the current prize winners. During your studies, you will repeatedly have to make important career decisions and set the course for your professional development. TUM Mentoring supports you.